After three years of planning the Furniture Manufacturing Eco-Museum officially opened in Tainan, southern Taiwan in May 2005 at the production complex of Yung Shing Furniture Co., Ltd., a wood furniture manufacturer with a history of more than half a century. The company launched the museum to chronicle the long history of Taiwan's wood industry. The museum is located in a factory idled by the shifting of production lines to mainland China. Yung Shing has witnessed the four-decade evolution of Taiwan's furniture industry through the two global oil crises and export boom of the 1970s, the industry's transformation in the 1980s, and the concentration on the development of creative furniture in the 1990s. Over the decades, Yung Shing has amassed a wealth of historical documents on the production of wood furniture, precious masterpieces, and production equipment employed over the four-decade period. Many of these items are on display in the museum. 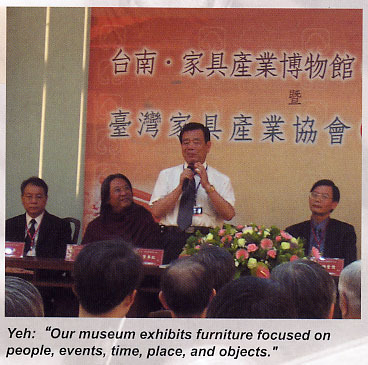 William Jiang, president of Yung Shing, says he created the museum to preserve and facilitate research on the history and culture of Taiwan's furniture industry. The museum also captures the spirit of industrial rebirth with displays of finely crafted furniture, educational exhibits, and space for making creative furniture. In the foreseeable future, the museum will also issue publications on the wood furniture craft. Displays follow the wood crafting process from tree growing to furniture processing. Exhibits are divided into three display halls devoted to historical furniture collections, modern oriental furniture, and furniture displays. There are also three activity areas, on talent cultivation and training, woodworking, and ecology and plant life. The Historical Furniture hall presents an interesting comparison of various furniture styles form different culture and traces the evolution of Chinese-style furniture. Half of the Modern Oriental Furniture section is reserved for displays on furniture research, development and applications aimed at nurturing domestic furniture talent. The hall also contains an area introducing various kinds of wood. The Furniture Display hall presents the local and international influences on furniture development in Taiwan. One of the most important sections of the museum is the Ecology and Plantation zone, with displays of domestic and exotic plants commonly used in the domestic furniture industry. In the Talent Cultivation and Training zone, professional teachers and professors are invited to teach conventional and creative woodworking methods to foster expertise needed to support the local wood furniture industry. The Woodworking Workshop zone provides opportunities for visitors to try their hand at woodworking. "Our museum fosters an interest in and respect for furniture through interactive exhibits focused on people, events, time, place, and objects, " says museum curator Yeh Tai-chin.